All the notes comprising a chord exist in a scale of some sort. For example, each chord in the key of C is built from notes in that key. Sounds obvious, but let’s unpack it anyway. I’ll start with the scale. Bear in mind that both of these images represent a two-octave C major scale, which has 15 notes. 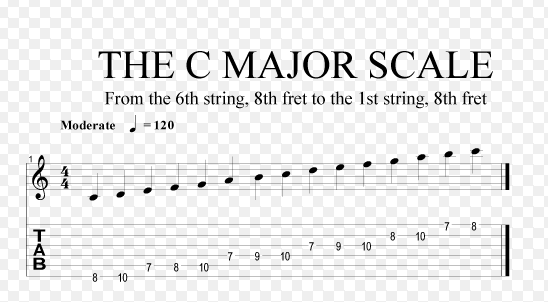 The 1st, 3rd, and 5th notes of the scale give you the C major arpeggio (6th string, fret 8), E (5th string, fret 7), and G (5th string, fret 10). The 2nd, 4th, and 6th notes give you a D minor arpeggio: D (6th string, fret 10), F (5th string, fret 8), and A (4th string, fret 7). The 3rd, 5th, and 7th notes give you the E minor arpeggio: E (5th string, fret 7), G (5th string, fret 10), and B (4th string, fret 9). The 4th, 6th, and 8th notes give you an F major arpeggio: F(5th string, fret 8), A (4th string, fret 7), and C (4th string, fret 10). The 5th, 7th, and 9th notes give you a G major arpeggio: G (5th string, fret 10), B(4th string, fret 9), and D (3rd string, fret 7). The 6th, 8th, and 10th notes give you an A minor arpeggio: A (4th string, fret 7), C (4th string, fret 10), and E (3rd string, fret 9). The 7th, 9th, and 11th notes give you a B diminished arpeggio: B (4th string, fret 9), D (3rd string, fret 7), and F (3rd string, fret 10). So the idea here is that when you see a progression with chords in the key of C, you can find the notes of the chord in a scale. Because of this, you can easily slip in other notes in the scale that aren’t part of the chord. This creates more tension, which is easily resolved by moving to a chord-tone. You get good at this by practicing only the chord-tones first. Play the C major arpeggio a few times, just to get used to it. Now play the A minor arpeggio until you’re comfortable with it. Then play from the C major arpeggio to the A minor arpeggio, treating them as a single unit. Once that’s comfortable, add the D minor arpeggio (play it by itself, then as part of a C – Amin – Dmin unit). Then add the G.
It will probably feel a bit unnatural, jumping from arpeggio to arpeggio (especially from A minor to D minor). All we’re doing here is teaching our fingers where to go for each chord. Don’t expect music yet. C major to A minor and D minor to G major link up pretty naturally. But A minor to D minor is a problem. You can’t really move naturally from the last note of the A minor arpeggio to the first note of the D minor arpeggio. D (3rd string, fret 7), F (3rd string, fret 10), and A (2nd string, fret 10). That’s the basic strategy: if something doesn’t seem to work, look for alternatives. The specific strategy here is to find another place on the neck to play the D minor arpeggio.